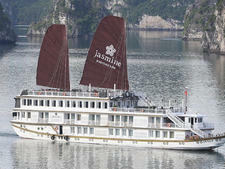 The 52-passenger Jahan is one of two vessels owned and operated on the Mekong by the Heritage Line, which provides upscale cruises in ships reflecting the elegance and heritage of bygone times. The opulent vessel takes its name from the Indian emperor Shah Jahan, and its decor evokes British India with its East India Club bar and Indian artwork. 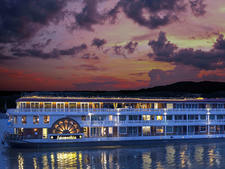 Facilities include a pool and whirlpool on the Sun Deck, spa, fitness center and steam room. 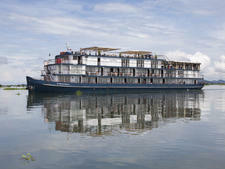 There are 26 cabins in four categories. The 12 Superior Staterooms on the Main Deck feature white, wooden furniture, bright decor and colorful artwork. The cabins measure 322 square feet, which includes a 43-square-foot private balcony. They each have a queen-sized bed (four of the cabins can be converted into twins) and bathroom with a large shower. Situated on the Upper Deck, eight Deluxe staterooms are exactly the same size as the Superior staterooms on the deck below. Filled with dark, colonial-style furniture and hand-painted ornaments, they are decorated in warm, orange tones. Beds in two of these cabins can be converted into twins. There are four Signature Suites. Two are located on the Main Deck and measure 387 square feet in total, which includes a 53-square-foot balcony. The other two are at the front of the Upper Deck and measure 344 square feet in total, including a 43-square-foot balcony. The color palette in all these suites is a sophisticated cream and indigo blue and they all have wooden four-poster beds with a heavy wooden chest at the foot of the bed for extra storage space. The Taj Suite on the Upper Deck is a generous 548 square feet, including two private balconies -- one with a whirlpool -- that measure a combined total of 118 square feet. The interior of the suite is decorated with ornate, inlaid wooden furniture. Equally impressive is the Lord Byron Suite, which is situated on the same deck and takes its inspiration from British-colonial days. It has a light green and hazelnut brown decor, a large bathroom and one 118-square-foot balcony with an outdoor whirlpool. Perks in the Signature, Taj and Lord Byron suites include tea and coffee making facilities, mini-bar, robes, sun hats and binoculars. The Raj of India Lobby Lounge is another throwback to the days of colonial India and is decorated in white, cream and golden tones with wide sofas, comfy chairs and Indian lamps. It also houses the reception desk and library. The East India Club is an open-air bar and lounge that recreates a British-India feel with inlaid furniture, Oriental lamps and Sanskrit carvings. The Observatory is an indoor lounge with panoramic windows to watch the passing scenery. It is also used for candlelit dinners. Meals are served in the Viceroy Dining Hall, located next to the bar on the Upper Deck. It features regional and international cuisine with aa mix of buffets and set menus and an open-seating arrangement. A daily highlight is the traditional afternoon tea. The Apsara Spa has two treatment rooms and offers a range of massages. Passengers can pick from 20 different aromatherapy oils to personalize their treatment. There is also a gym and steam room. The Sun Deck has a mosaic-tiled pool and whirlpool. 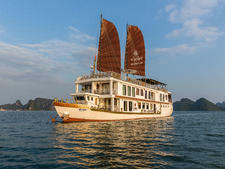 The Jahan sails seven-night cruises through Vietnam and Cambodia from Ho Chi Minh City to Siem Reap, or in reverse, and also offers three or four-night cruises between Phnom Penh and Siem Reap or a three-night sailing between Ho Chi Minh City and Phnom Penh.